Insulation keeps a thermal barrier between you and the elements. The greater the barrier the greater your savings and comfort. When done along with Air Sealing, Insulation will keep your home cool in the summer and warma in the winter. EPA recommends insulation levels of R49-R60 for homes in Colorado. A job for a brave weekend warrior. But make sure to Air Seal before installing more insulation to existing levels. This will help eliminate conditioned air escaping. Regular maintenance can help your heating system work at its peak efficiency. Cooling costs are often times your highest cost of all energy usage. Learn how to lower your costs. Air sealing is the #1 improvement you can make to your home. Find out why. Your garden and yard can produce alot of waste and use alot of water, learn how to reduce some of this. New Energy Star appliances can pay for themselves over time. Check out your appliances today. 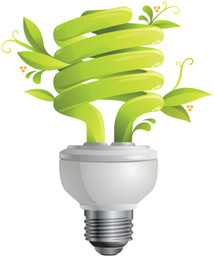 Save 75% or more on your lighting energy cost. We hope to help home owners save energy, lower their carbon footprint and make their home more safe and comfortable. By implementing the projects found on our website you can save money on energy and help the environment at the same time.